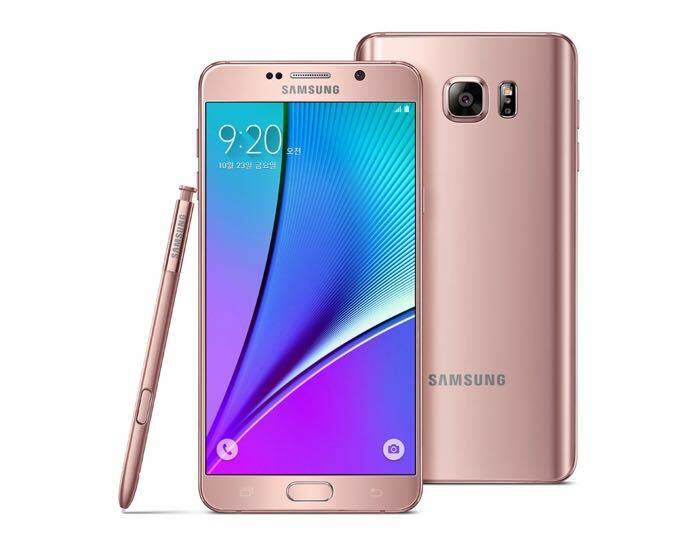 Samsung has announced two new colors of its Galaxy Note 5 smartphone, Pink Gold and Silver Titanium and these new colors will go on sale in South Korea on the 23rd of October. The Pink Gold Galaxy Note 5 will be available with 64GB of storage and this handset will retail for 965,800 won, which is about $856 at the current exchange rate. The Silver Titanium model will be available in 32GB and 64GB versions and prices for this model start at 899,800 won, this is $798 at the current exchange rate. As a reminder the Samsung Galaxy Note 5 comes with a 5.7 inch display with a QHD resolution of 2560 x 1440 pixels, the handset is powered by a Samsung Exynos 7420 processor and comes with 4GB of RAM. Other specifications on the device include a 5 megapixel front camera and a 16 megapixel rear camera, the handset also comes with Android 5.1 Lollipop. As yet there are no details on whether Samsung will launch these new color versions of the note 5 in other countries, as soon as we get some more details, we will let you guys know.